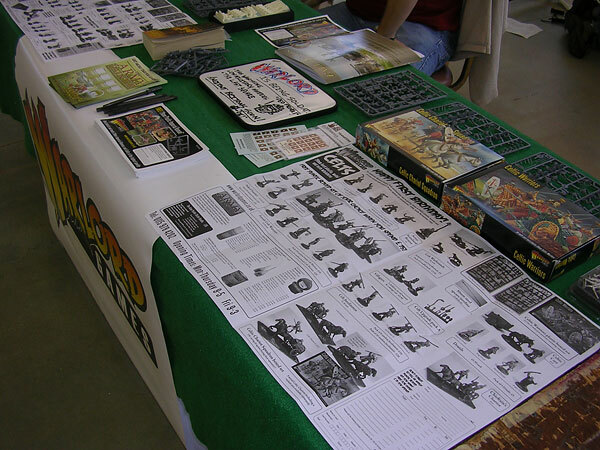 It’s been a wild and woolly month for Warlord Games on the convention circuit. Even as the year draws to a close and we celebrate the first anniversary of being in business, we are still riding across the continents to spread the word of Warlord’s excellent hard plastic and metal ranges. Warlord’s Gareth and Mark depart the green and pleasant shores of the UK to invade the low countries with a Range Rover full of Warlord goodies. A great show and well-done all around. Next year a bigger presence with a bigger table! After arriving in Antwerp, we had a couple of shandies and turned in for an early evening (yeah right). Bright, early, and breezy, we set up the stand with the speed of a gazelle (post watering hole mauling). We speak to hundreds if not thousands of eager gamers and wend our way among nearly 2,000 gamers and shed loads of trade stands. Fended off a Roman assault (see photo above). Apparently he was muttering something about appearance residuals or some-such. We were greatly entertained. Witnessed lots of lovely game tables with the top being a Vietnam Air-Cav game followed by Stukas dive-bombing an English convoy. Mark picked up a handsome box of Napoleonics, whilst Gareth buys a submarine and a hammerhead shark (thus beginning his undersea kingdom). Make a quick escape and hit the English shore line around midnight GMT. By 2am both weary lads are tucked up in bed with a steaming mug of hot chocolate and their favourite storybook. At the same time across the ocean, Warlord’s American representatives Brett and Rich packed up the van with piles of free plastic Roman Legionaries, a modest table, a selection of boxed sets, and a few mail order posters to begin the trek from the Washington D.C. area to historic Civil War environs of Gettysburg, Pennsylvania for Fall-In 2008. 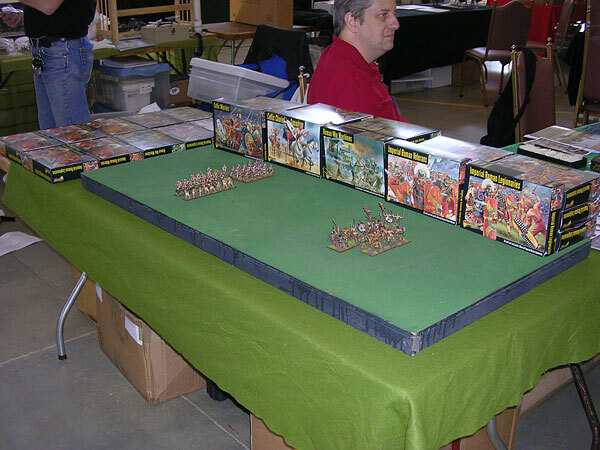 This excellent 3-day event is one of a trifecta of historical miniatures conventions held in the eastern United States by HMGS East (Historical Miniatures Gaming Society), the other two being Cold Wars in the spring and Historicon in the summer. After an uneventful ride to the convention site on Friday, our modest table was set up with usual enormous effort (in about 10 minutes) and the show began. All throughout the weekend we received nothing but positive comments and interesting conversation as miniature gamers and collectors of all types came up to fondle the lovely miniatures we had at the table, ask us what we were up to next (much to their chagrin we were very tight-lipped about the new range), to discuss all things Celt and Roman, and to sign up for our newsletter (whilst reaping the bounty of a free hard plastic Early Imperial Roman Legionary in return. 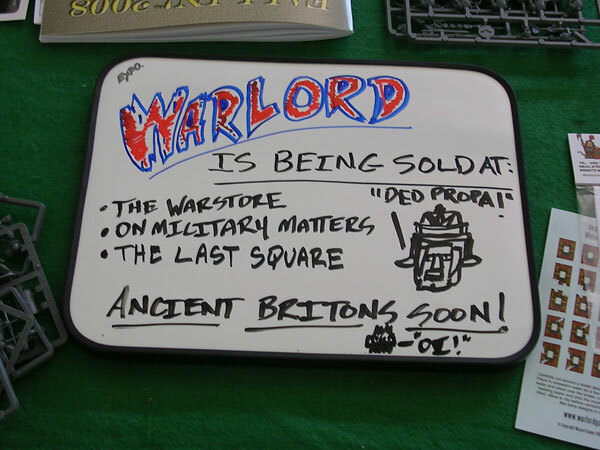 As you can see above no expense has been spared on the corporate signage we provided for the show pointing out all of the retailers that we could find at the show who were selling Warlord Games products. Thanks very much to each and every one of them for their support, opinions, and especially a couple slices of pizza (Thanks Warstore Don!). 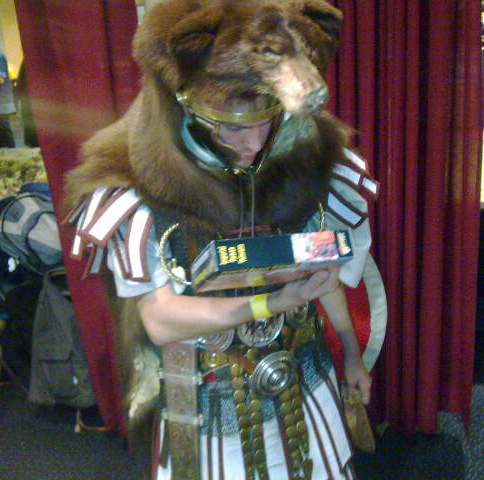 Each day was filled with interesting people who truly made us feel good about what we had to offer for their wargaming needs. We truly thank everyone who came up to talk with us, customer and retailer alike. 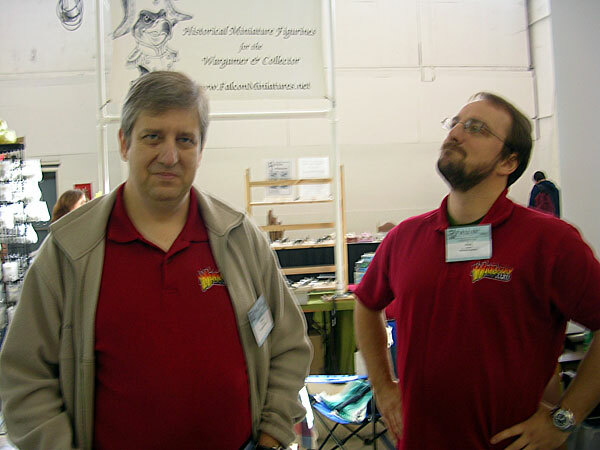 After a close call with a fox crossing the battlefield and a series of gastronomic misadventures too hideous to recount here, Brett and Rich packed up their wares and headed back to their lairs to await the spring thaw and the chance to do it all again at Cold Wars 2009!